Customer Reviews - Light Instruments Ltd.
“I’ve been using lasers in my clinic since 2002. The most important & dominant laser in my clinic is the LiteTouch™ Er: YAG laser (2940nm). 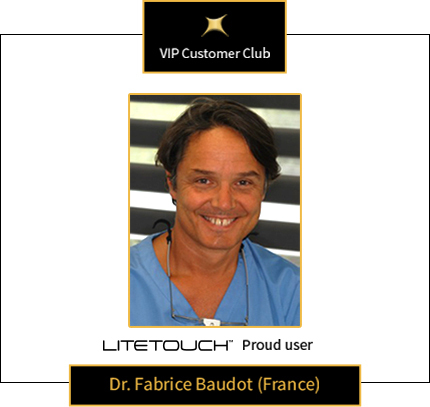 LiteTouch™ is the main tool used in my clinic, for oral surgery procedures among others. 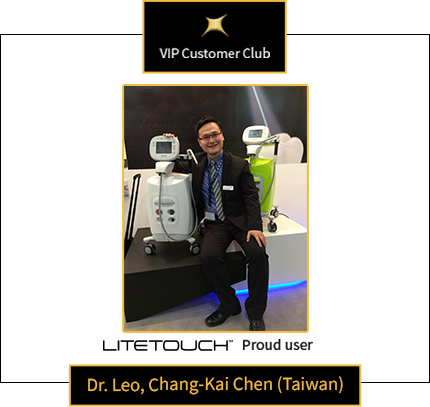 LiteTouch™ has a wide range of advantages vs. others lasers: Due to his Laser-in-the-Handpiece technology (no fiber), its powerful laser output and the unique ergonomic applicator, allow me to conduct fast and precise procedures, helping me to achieve patient’s satisfaction. LiteTouch™ is the smallest Er:YAG laser in the world and can fit anywhere in my clinic. One should not underestimate that maintenance of other Er:YAG lasers is expensive due to fiber related issues. 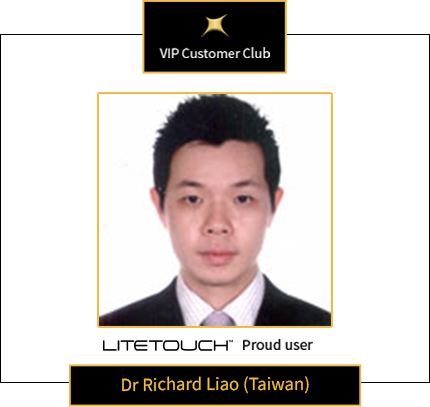 LiteTouch™’s high reliability saves unnecessary maintenance costs and increases my clinic’s revenues. As the first doctor in the world that has LiteTouch™ in his hands & after experiencing many other lasers, I immediately “fell in love” with this device. 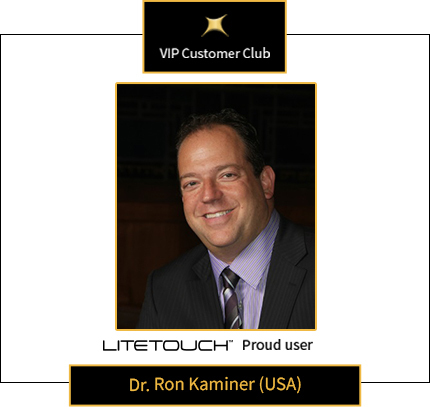 LiteTouch™ had become an integral and essential part of clinic, and indispensable in my professional career. 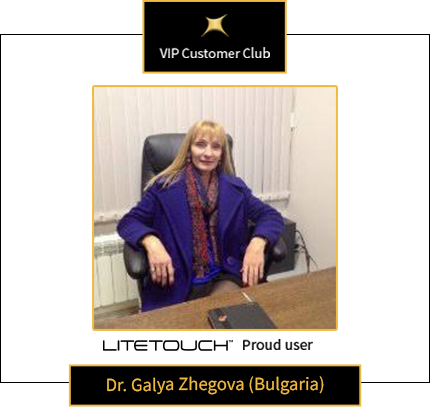 I recommend my colleagues to have LiteTouch™, as LiteTouch™ named advantages contributed to boost my clinic’s reputation and revenues. Professor with contract at the University of Genoa, Italy. President of A.L.D.I.- Accademia Laser Dentale Italiana- Italian Study Club of the Academy of Laser Dentistry. “I started in 1996 using an Erbium:YAG laser in my practice. It was an extraordinary experience and since then I changed my operating modes. The problem I had using this kind of wavelength was the fragility of the fiber due to the fact that contain hydroxyl groups. The revolutionary technology introduced by the LiteTouch with the laser mechanism included in the handpiece allows overtaking this problem and ensuring exceptional performance. The Er:YAG laser has an active medium of Yttrium-Aluminium-Garnet doped with Erbium ions and emits free-running pulsed laser energy at a wavelength of 2,940 nm. These wavelengths have a high absorption in water, which makes their application appropriate when ablating dental hard tissue, bone or oral soft tissue. The Erbium YAG laser wavelength is well absorbed by water and hydroxyapatite contained at different component rates in hard tissue and appeared to offer safe use in cavity preparation and in bone surgery. The absorption in water permits the ablation of oral soft tissue, thus assuring to this kind of laser to be an “all tissue laser. The vaporization of interstitial water provided by the Er:YAG laser results in an explosive dislocation of target hard tissue. 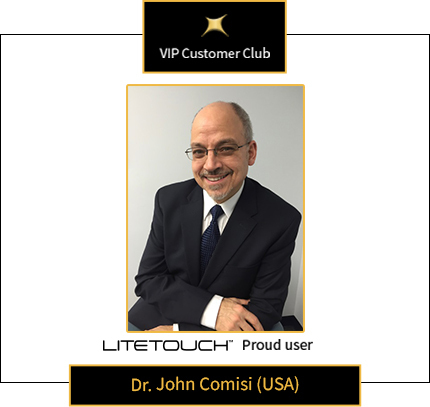 “As a minimally invasive cosmetic implant focused dentist who has used erbium lasers for almost 14 years, I am very impressed with ergonomics and efficiency of the Lite Touch laser. Faculty of Dentistry, European University R. Macedonia. We taught them the skills they would need. And the tools. Then, as now, technology was the key to our survival. “Pale Blue Dot” by Carl Sagan. Department of Periodontology, School of Dentistry, National Defense Medical Center and Tri-Service General Hospital, Taipei, Taiwan, ROC. Head of School of Dentistry, Medical University of Vienna, Austria. Past President of SOLA – International Society of Oral Laser Applications. 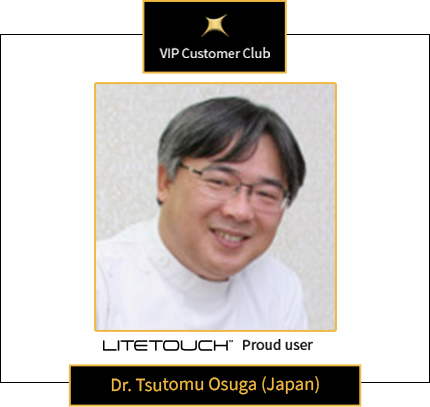 “I would like to express my sincere gratitude to Light Instruments for delivering the new LiteTouch™ laser. The Laser-in-the Handpiece™ is really a great assistant. LiteTouch’s innovative direct delivery system allows flexibility, thus LiteTouch™ can be used in any part of the mouth without any difficulty. Additionally, it has no fiber and there is a minimum loss of energy in the transmission from the laser chamber to the mouth. I am very impressed of the duration of the tips, a fact that has tremendously reduced our consumption costs. LiteTouch’s handling is very easy and smooth. The indicator’s fiber tips are very well assorted and I highly recommend its use”. Oral Pathology Department, Faculty of Dentistry, Medical University – Plovdiv, Bulgaria. 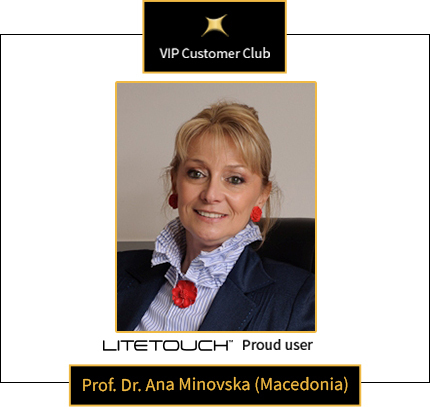 “I graduated from the Faculty of Dental Medicine, Medical University – Plovdiv, Bulgaria in 2004, later obtained Ph.D and M.Sc in Endodontics at the Operative Dentistry and Endodontic Department in the same University in 2008. I focused my efforts on researching and teaching and in 2009 I was promoted to Assistant Professor in the University clinic. As leading dental faculty in Bulgaria, we provide our students a new therapy concepts for caries removal and also provide our patients safety, effective and pain-free caries treatment. The name of this new concept is LiteTouch™. The LiteTouch™ Er:YAG laser uses a revolutionary direct delivery system – “Laser in a handpiece” in which the laser chamber is located in the handpiece. Thus eliminates the need for fiber delivery system and avoid the loss of energy or efficiency. LiteTouch™’s “no fiber” design gives more stable transmitting, and less expense for replacement. The articulated arm simplifies the introduction of the laser into the oral cavity and eases its use on both soft and hard dental tissues. 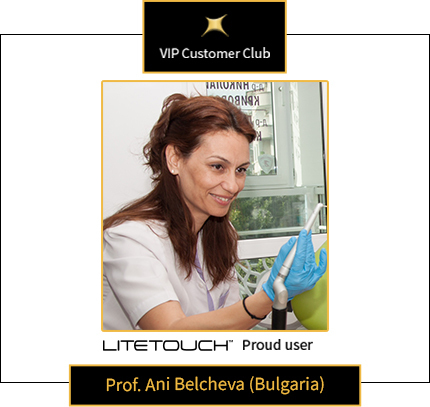 I started evaluating LiteTouch™ for oral tissue treatment one year ago, and began to use LiteTouch™ for my clinical practice and teaching since 2009. My researches are focused on caries and non caries defects laser treatment with respect to patient’s comfort and procedures efficiency. Caries is in everyone’s mouth and many patients are anxious when faced with the drill. Operative caries treatment generally also means removal of healthy tooth substance and consequent damage. Light Instruments a healthy alternative with which you can eliminate caries in seconds completely without drilling and without pain. You also fully preserve the healthy tooth substance. 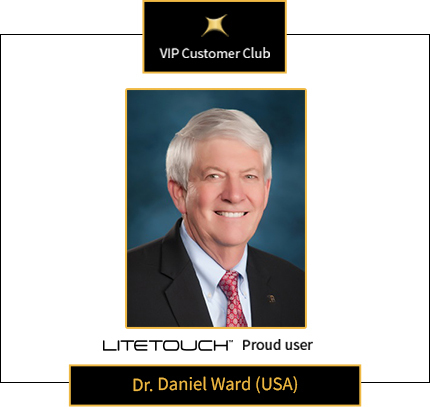 In my practice, I use the LiteTouch™ for general restorative work, “laser anesthesia”, crown lengthening, periodontal treatment and many other procedures. It is part of my professional self-confidence and it has become an integral part of the practice. Personally, I like its powerful cutting ability that allows me to precede any hard tissue treatments more easily. Antipolis, France and University Hospital of Nice. 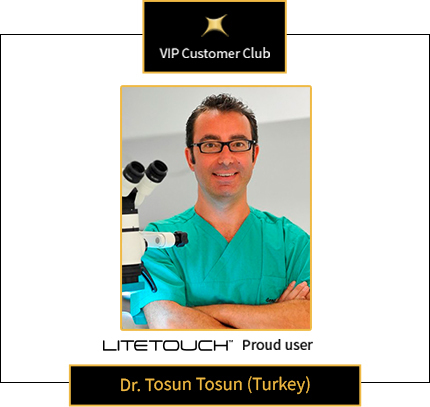 Dr. Tosun Tosun – Private practioner, Istanbul, Turkey. “In my personal experience Erbium laser applications or Er:YAG assisted procedures are very useful and lead to perform superior dentistry in comparison with conventional tools. Thus I use frequently different erbium laser devices in my daily practice. ergonomic and due to the “Laser-in-the-Handpiece” industrial design, it permits me to work even in difficult angulations with superior vision. The variety of different erbium lasers that I use, involve significant maintenance costs. 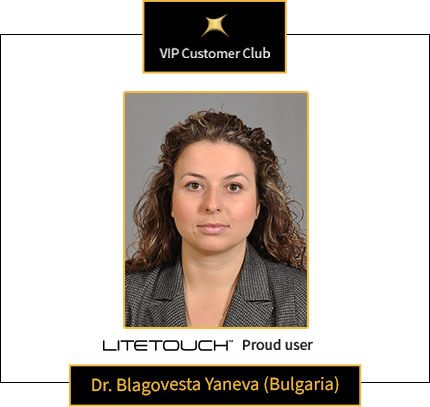 LiteTouch`s low maintenance costs lead me to prefer it, to reduce overall expenses in my clinic while enjoying high performance and all the benefits unique to laser dentistry: micro surgery, quicker healing, minimal invasive treatments and higher acceptance of dental treatments by patients. 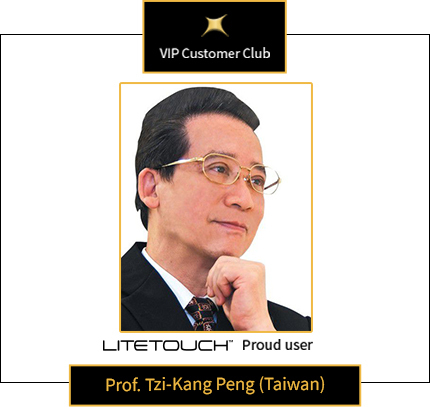 I recommend my friendly LiteTouch to my colleagues, especially for its short learning curve, depending from a simple and clear menu program covering almost all the needed indications. Scientific Instructor; Division of Cariology and Endodontology, University of Geneva, Switzerland. Instructor in Dental Laser Applications, Program of Master of Advanced Studies in Oral Biology, University of Geneva, Switzerland. Prof. Ani Belcheva – DDS, MSc, PhD. 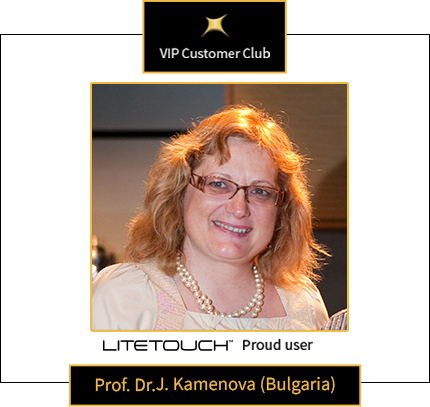 Associate Professor, Department of Pediatric Dentistry Faculty of Dental Medicine, Medical University, Plovdiv, Bulgaria. “After receiving a conventional training in Periodontics, it is not always easy to leave old paradigms that left no place for Laser Therapy. In the past ten years, scientific evidence has emerged, showing the effectiveness and advantages of Er:Yag Laser therapy in periodontics and oral surgery. This allowed me to open my mind and explore the wonderful world of Laser therapy. “I’ve been working with Erbium Yag lasers for 7 years in my everyday practice. I’ve been using (and I currently still use) both Er-YAG lasers with fiber transmission and Er-YAG lasers with articulated arm transmission. It’s well known that lasers with fibers are very simple to use (specially the fiber based ones) but the performance is worse than the articulated arm one. 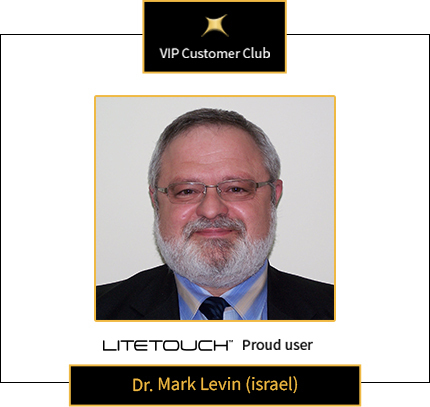 By using the new LiteTouch™, I could find a good mix between the 2 systems mentioned above. The “Laser in Handpiece” technology allows me to have the same (perhaps even better) performance of an articulated arm laser, and at the same time, to have an ergonomics which is even higher than the fiber. In addition to these positive characteristics, there is the fact that there are no fiber deterioration or mirrors bad alignment problems. Due to this particular technology, this laser has small dimensions and an evidently reduced weight, and this allows the user to move it easily in restricted spaces, and to carry it from one clinic to another one without any problem (I’m used to work in 2 different clinics which are 20 km apart); moreover, being so small, it looks very familiar, and it is extremely important for those like me, who work a lot with children, for having a funny approach with them. And it is precisely in working with children that I can appreciate the excellent ergonomics of the handpiece, which can rotate 360°, and being so thin allows me to reach every part of the mouth; moreover the possibility to replace the tips without the help of any instruments, and to rotate it on its own axis in order to adapt it to teeth’s conformation, speeds up the everyday practice. Professor and Chairman, Dental Department, Cheng Hsin General Hospital. Degree in Peridontology and Implantology. Founder of the “Institut de Micro Chirurgie Parodontale” (Montpellier, France). 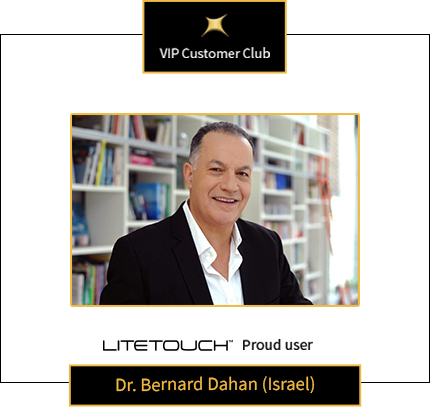 Former Dean, Hadassah School of Dental Medicine, The Hebrew University- Jerusalem, Israel. By Dr. Blagovesta Yaneva, Plovdiv University, Bulgaria. 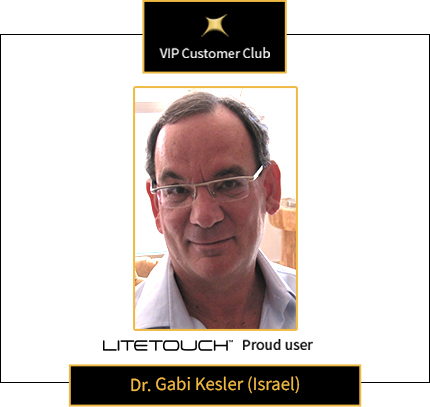 “I have been a proud user of LiteTouch for the last 3 years. I am working with this amazing laser system as a general practitioner in our private practice, using it every day in almost every procedure we are performing. In a time when periodontal disease is are one of the most common diseases in the oral cavity it is important to have adequate treatment tools for it. The LiteTouch and its chisel tip give us the chance to do this. “I’d been using dental lasers for more than 25 years, and for the last 15 years researching Er:YAG laser bone applications at the Oral Rehabilitation School of Dental Medicine in Tel Aviv University. 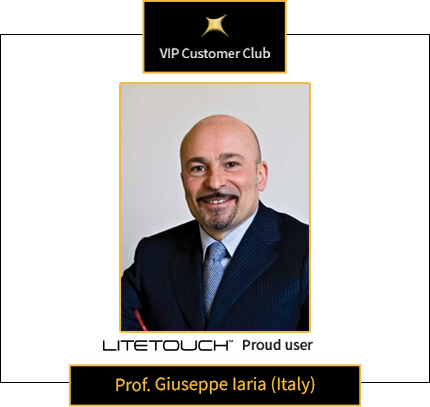 In my whole career and research work, I had the opportunity to work with different dental lasers, among them LiteTouch™, the best dental Er:YAG laser in my point of view, mainly because its high delivered energy as a consequence of the position of the active medium. In addition, as there is no need to change delivery system, there are almost no maintenance costs or efforts involved in the use of LiteTouch™. LiteTouch’s handpiece is small and feels like a turbine drill, allowing complete free movement, thus the learning curve and transition from using traditional tools, is very short. Administrative Director Keyaki Dori Dental Clinic, Fukoka City, Japan. Medical Director, Mediclinic Medical Center, Tel Aviv, Israel. Faculty of Dental Medicine, Medical University, of Sofia, Bulgaria. “The LiteTouch™ laser device is the most perfect Er:YAG laser. This device has very good performance and efficient parameters. Dental procedures in the field of cariesology, endodontics, periodontology, prosthetic dentistry and oral surgery can be performed with LiteTouch™. The device has all the necessary parameters of safety at work, it doesn’t have any conducing system and thus the amount of laser energy for treatment of soft and hard tissues is guaranteed. The maintenance of the Litetouch™ laser is guaranteed by the local distributor, providing a professional staff with the necessary technical qualifications. The local distributor also provides perfect theoretical and practical training. Laser therapy is the future of the dentistry and more and more colleagues understand this. Department of Endodontics – Hadassah School of Dental Medicine, The Hebrew University, Jerusalem, Israel. Coordinator of the course for lasers in dentistry for our final year students. “I have worked clinically with several lasers and also conducted research projects studying their applications in clinical procedures. The Lite Touch™ laser by Light Instruments Ltd. is an important addition to the endodontic armamentarium since our research studies show that this laser is able to clean efficiently the root canal system producing good results, even in difficult cases. The LiteTouch™ laser hand piece has good ergonomics and is user friendly, such that the learning curve is short. The small dimensions of this laser enable ease of use intraorally as well as making it simple to move between clinics of various departments. Onkun Group, Osuga Dental Clinic WHERE – city , Japan. ETERNAdent private clinic, Skopje, R. Macedonia. 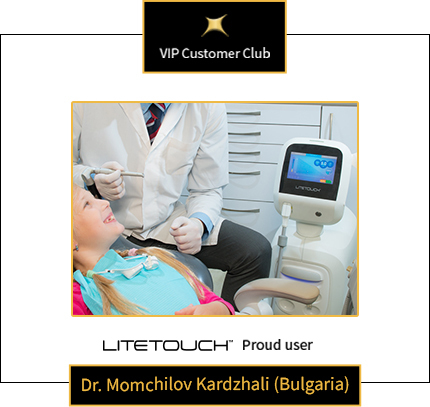 “It is a great pleasure having the LiteTouch™ laser in our dental office! I `ve been using Er:YAG lasers for five years, but the LiteTouch™ made a brake through in the everyday practice of laser dentistry! The efficiency of working in hard and soft tissues, the simplicity of the software, the “easy going” ergonomics and the easy device maintenance makes this high-tech device the most frequently used one in the office! 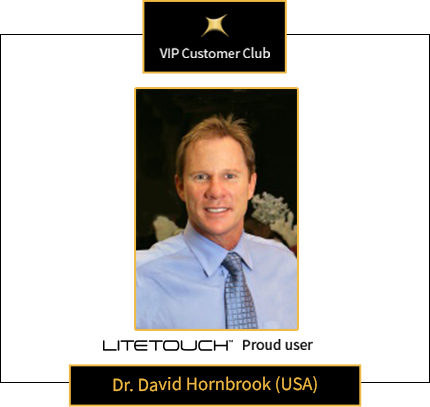 Having the LiteTouch™ always by the hand, many procedures got faster and easier. It helps making superior aesthetics when combined with prosthetics, less complicated post operative period in surgical procedures, less anesthesia appliance for restorative fillings. It is amazing for perio! Senior assistant, Department of Pediatric Dentistry, Faculty of Dental Medicine, Medical University, of Sofia, Bulgaria. 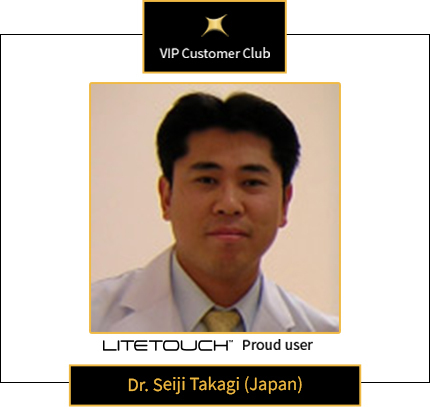 “I’ve been working with LiteTouch™ Er:YAG laser for one year. I am extremely pleased with the ease of use. It is easy to work with it; the handpieve is flexible, lightweight and comfortable. 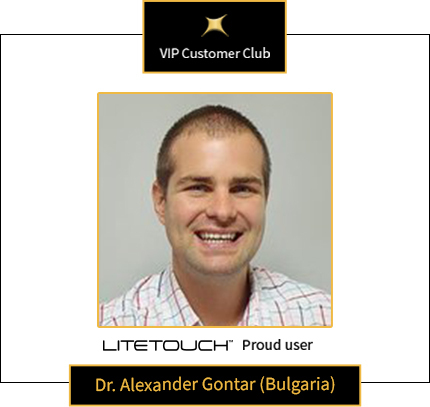 LiteTouch™ is widely used in the treatment of dental hard tissues, periodontology and dental surgery. 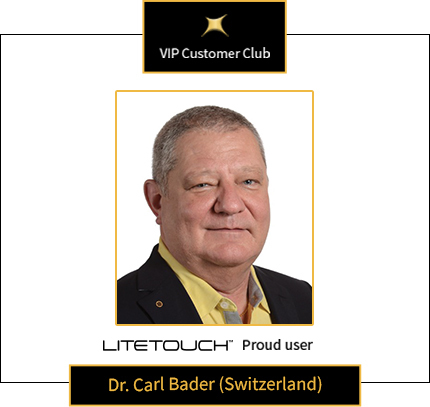 The LiteTouch™ laser has powerful bactericidal effect, preventing complications after surgical procedures. LiteTouch™ is extremely convenient for cavity preparation. It is the absolute instrument of the modern dentistry, which provides complete comfort when treating patients – no pain, no vibration, no stress. It is especially widely used in pediatric dentistry. 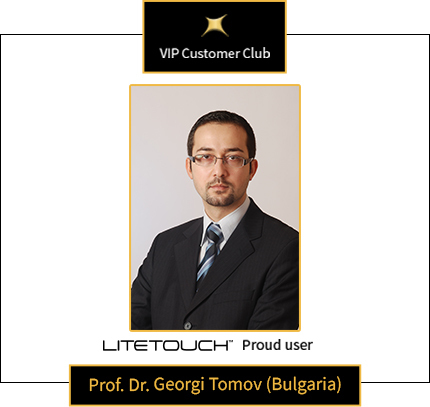 In the treatment of children, the LiteTouch™ laser is mandatory for all possible cases and manipulations. Children are the future, they should not be afraid of the dentist but should acquire habits of regular visits to him. That’s why the LiteTouch™ laser is mandatory for children – no fear, no pain – no bad memories. 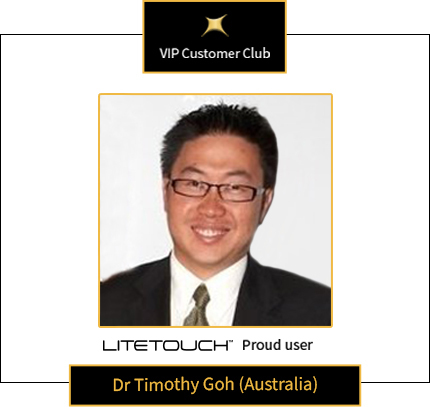 “I was one of the first dentists to use the LiteTouch™ in Australia. Having used other lasers before, I was happily surprised at the amazing “cutting” speed that could be achieved without the use of local anesthesia (LA). In fact, I find that I use LA for restorations only a few times each week. In our practice, we use the LiteTouch™ for general restorative work, “laser anesthesia”, crown lengthening, sterilizing preps and many other procedures. It is part of my day and has become an integral part of the practice. I generally use the laser in conjunction with the high speed handpiece where warranted, particularly where amalgams are being replaced. I have been very impressed by the longevity of the tips which has meant a significant reduction in consumable costs. The LiteTouch™’s small size and durability is also a draw card in my opinion. My associate and I routinely swap lasers, as she favors the LiteTouch™ and we have to fight over who gets to use it. Due to the relatively light weight of the unit, moving it from room to room is easier than for my other laser. The laser, being in the handpiece means that there are no expensive fibers that can break. Also, the power output seems to be much stronger than other lasers I have used at the same settings. My only real criticisms are firstly, that I found the handpiece initially uncomfortable. 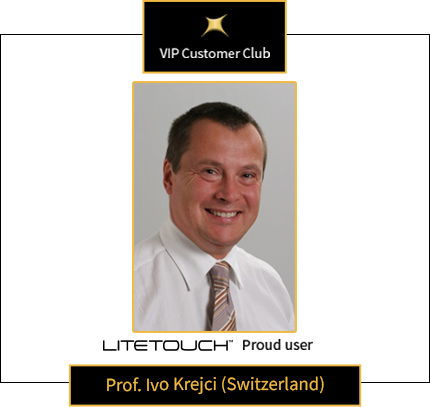 However, after using the LiteTouch™ continuously for about a week or so, it because easier to use. 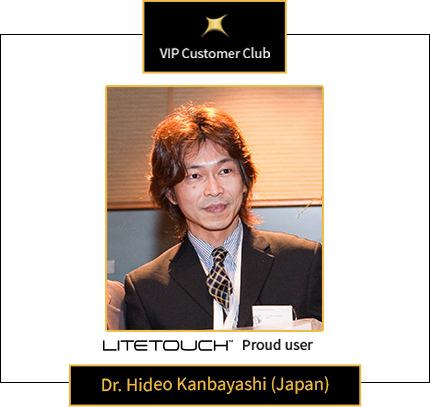 “I started working with LiteTouch™ last year. According to the Mayan’s calendar we were expecting for the end of the world, but for me 2012 has become a new beginning. 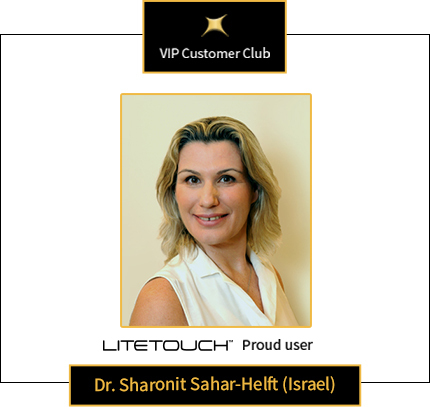 LiteTouch™ completely changed my philosophy and professional view of treatment that with each passing day was noticed by my patients. With this great technical masterpiece in hands, I feel myself, as the French’s says “Art Dentaire”, not just a profession, but an art, to feel unique! It is easily to perform cleaning of cavity or to make an incision, even complex surgical procedures are available in daily practice, with one undeniable and unbeatable advantage…. bactericidal effect at work and ability to be minimally invasive, that gives the patients comfortable treatment and the most important, continuous of everyday’ s life, which is precious and appreciable for them. Well-structured menu and array of tips facilitate my work, save my time and improve performance of my income, invaluable for every colleague. 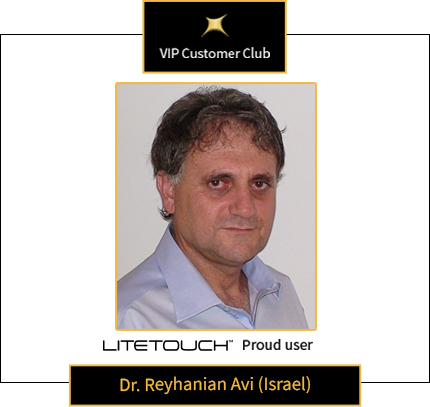 “Since the middle of 2009 I have been working with LiteTouch™ laser system. I am exceptionally pleased with my practice with it. I apply laser therapy in the field of pediatric dentistry, therapy and surgery. The results are much better in comparison with the conventional therapy. 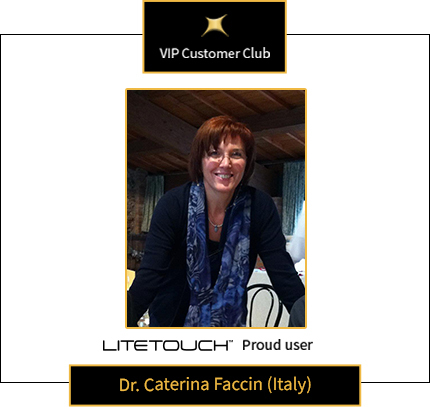 I am particularly grateful to LiteTouch™ laser, because all children come to me without fear. The parents are also pleased to see their smiling faces. Because I am a young dentist, I find it very interesting to perform minor surgical interventions that in other cases I would not have undertaken. The variety of different options increases my qualification and maintains my interest in different approaches in dentistry. Futaba Dental Clinic City, Japan. 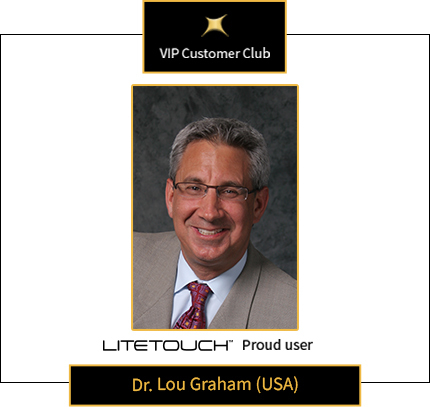 “We have been working with LiteTouch™ dental laser for two years. 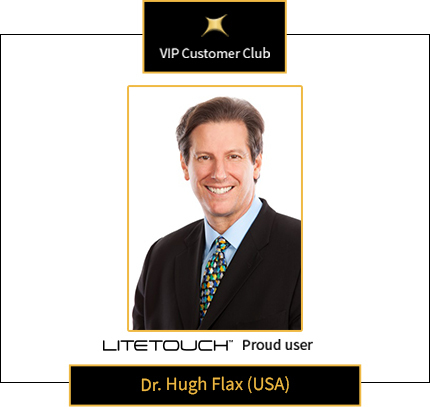 There are almost no treatments that we do not perform with LiteTouch™. It copes wonderfully with the cleaning of carious defects. The patients are very pleased; there is no pain, no noise and no vibration from the turbine. It is surprising how many patients are fearful of the specific noise and vibrations! In periodontology LiteTouch™ is irreplaceable. The curettage of the periodontal pockets with hand curettes is labor-consuming and tiring work. My practice of many years as a periodontologist damaged my hands and I almost gave up doing my favorite work. 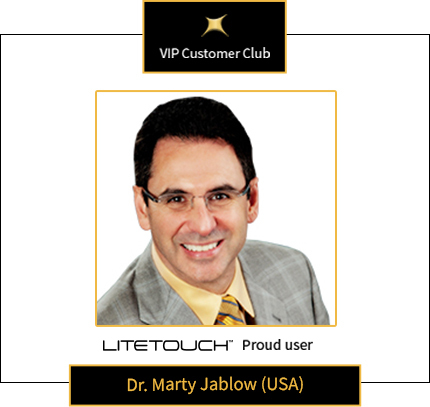 The LiteTouch™ laser changed my decision and I feel great in my dental room once again. 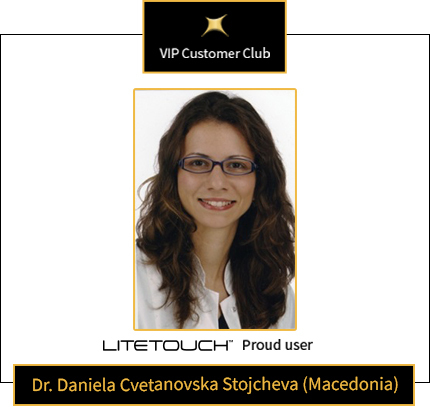 LiteTouch™ completely changed our dental practice – it changed the attitude of the patients and even of our colleagues towards us. 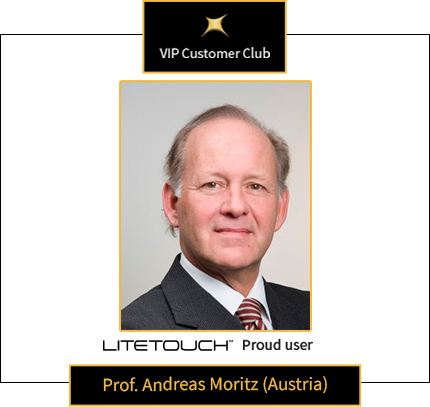 A patient who was once treated with the LiteTouch™ laser does not accept the performance of conventional treatment anymore. He is even ready to wait for an appointment! 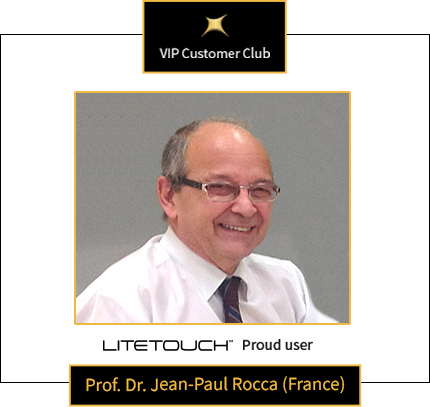 The LiteTouch™ laser significantly facilitated our work in every respect. The healing process passes much faster. The LiteTouch™ dental laser is well accepted by both children and adults.